Working directly from original negatives, cutting edge technology has been used to create a picture that has been color-enhanced and completely digitally restored. The result is a hi-def picture that is cleaner and richer than ever before. Jane Austen’s Pride and Prejudice remains one of the most enduring classics of English literature. BBC’s 1995 miniseries brought a faithfully told, beautifully shot, and finely acted version of that novel to the television screens of millions. Steering away from the previous “stagey” versions of period literature on the screen, this adaptation opted for a more cinematic pace that acknowledged a life for the novel’s characters outside of the drawing rooms. 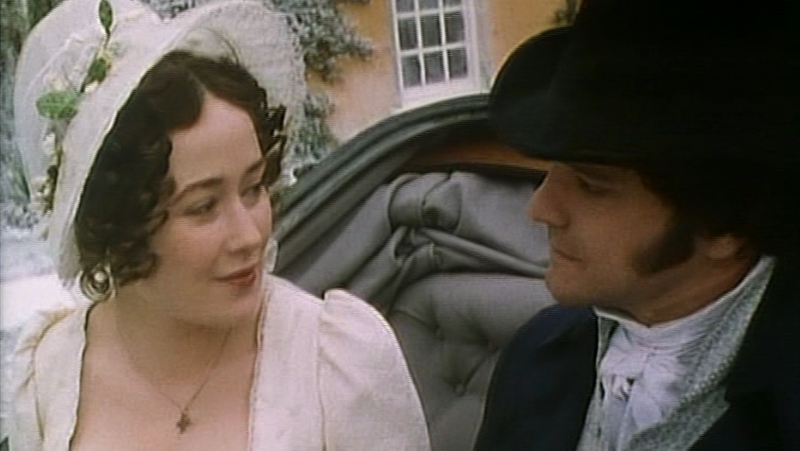 The miniseries was also on the vanguard of Austen adaptations on film and television that led to Jane Austen being named one of the Entertainers of the Year in a December 1995 Entertainment Weekly. 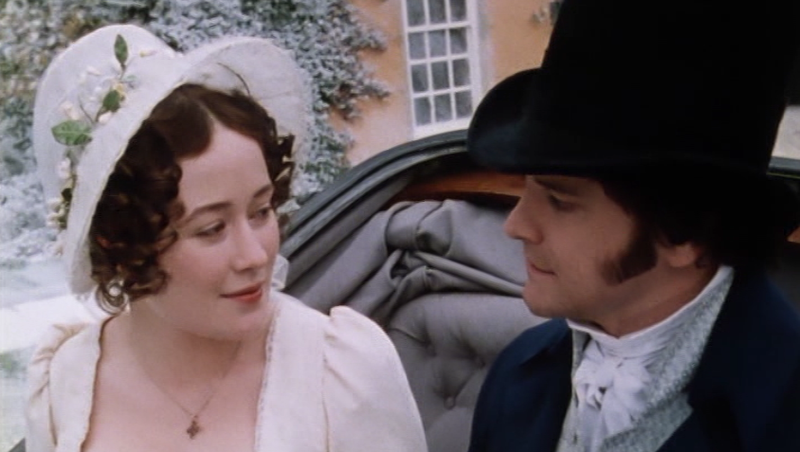 Witty, energetic Elizabeth Bennet (Jennifer Ehle) and brooding, aloof Mr. Darcy (Colin Firth) are a pair of star-crossed lovers separated by the subtleties of social classes in Regency England. 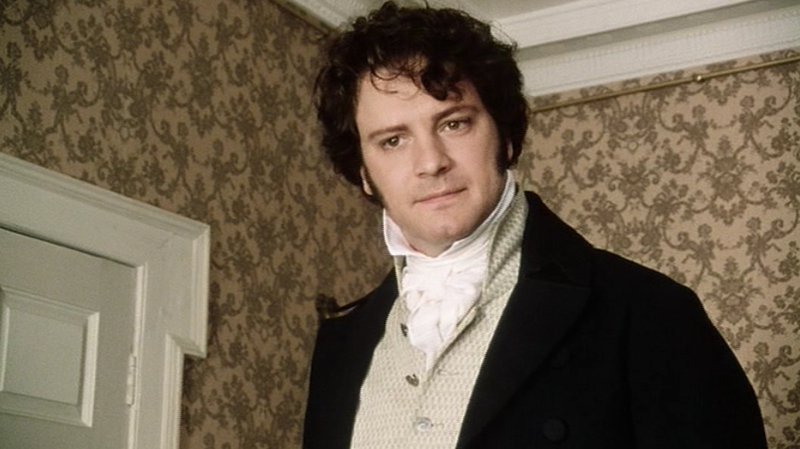 When Darcy slights Elizabeth upon his arrival in her town, declaring her beneath him, she vows to dislike him forever. What follows is a series of misunderstandings that forms one of the best “will they, won’t they” stories. Below are screen captures from the Restored Edition (top) compared to captures from the Special Edition (bottom). The results are apparent in a side-by-side comparison, but frankly would have escaped my notice otherwise. (Unless I owned an HD television, in which case I probably would have been doing backflips over this Restored Edition.) What the world actually needs at this point, as far as this production is concerned, is a DVD with the option to watch all six episodes as one continuous film, with credits only at the very end. But perhaps that’s just my own wishful thinking. * Lasting Impressions. 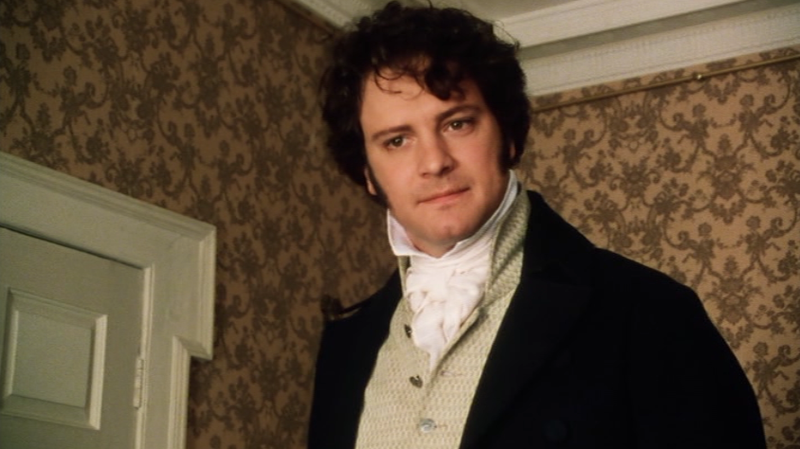 Filmed in 2006, this featurette includes interviews with cast and crew members as they look back at the incredible success of “PRIDE AND PREJUDICE” that changed the appeal and reach of costume dramas. Includes interviews with Sue Birtwistle (Producer), Benjamin Whitrow (Mr. Bennet), Crispin Bonham Carter (Mr. Bingley), Alison Steadman (Mrs. Bennet), David Bamber (Mr. Collins), Lucy Briers (Mary Bennet), Adrian Lukis (Wickham), and Carl Davis (Composer). * An Impromptu Walkabout with Adrian Lukis and Lucy Briers. For some reason, a camera follows Lukis (Wickham) and Briers (Mary Bennet) as they wander around the grounds of Luckington Court, also known as the Bennets’ home of Longbourn. 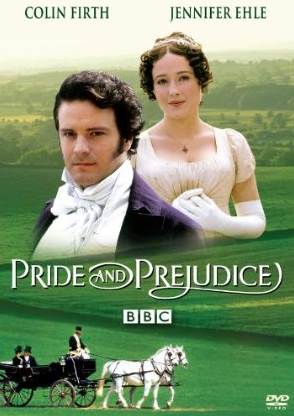 * Pride and Prejudice: A Turning Point for Period Drama. Andrew Davies (Screenwriter), Alan Ayres (Drama Publicist), Baz Bamigboye (TV Critic), and Dinah Collin (Costume Designer) discuss the incredible critical and cultural success of the program. * Technical Restoration. An in-depth look at the restoration process. The previous, ‘unrestored’ version I used to have on DVD did just that when ‘play all’ was chosen. For the longest time I had no real sense of when each of the episodes began or ended; only a freeze-frame hinted towards it. I was very disappointed when I got the restored DVD and it didn’t do the same. The Blu-Ray, well, we’ll see; I haven’t tried yet. The restoration, to my eyes, is MUCH more evident with the Blu-Ray vs the DVD (I played both on the same equipment). The restoration is not just obvious visually (how much more obvious the stitches on the curtains, the texture of the clothing, are! ), but aurally. I could hear birds where I never knew they existed, heard the gentle ‘ting’ of a clock striking the hour within the halls of Pemberley. Just fantastic. Thank you for this explanation of “Restored Version”…I saw it on Amazon for sale, have VCR tapes at the moment, but would love the DVD. Didn’t want to buy a pig-in-a-poke though, since I had no clue what the “R..V..” term alluded to. I TOTALLY agree about one continuous film without the intro and credits in-between episodes…however, I do love listening to the Mozart piece played along with those. (DVD Review) � DVD Corner’s blog” was indeed great! Ican’t see eye to eye along with you even more! Finally appears like Ilocated a site definitely worth browsing.